Relate: Perhaps these words are fairly new to you, but I have heard them time and time again. At least once a year I feel that I have heard someone preach on them. I have read works by great men of the faith who write on them. A few times a year, I find myself reading them as I work my way through the Bible. They are so familiar that I sometimes forget just how audacious both of these statements are. First, there is the thief on the cross. “Jesus, remember me when you come into your kingdom.” There’s two ways to look at this. The more likely is that this thief on the cross held to the traditional view of the Messiah and he still believed Jesus was it. Even though the man had been beaten, mocked, whipped, and then nailed to a cross right next to him, this guy believed, somehow, Jesus was going to come down from that cross, sweep the Romans out of Israel, and re-establish a golden age for the kingdom of Israel. The second view was that this thief was one of the first to truly understand that the Messiah and the Kingdom were both something that would take place, somehow, beyond this physical world. Perhaps he had heard some teaching from Jesus and, even now, was beginning to connect the dots. He got it. Even before the disciples truly understand, this insurrectionist became a true believer. Either way, the faith he displayed in Jesus is absolutely amazing. And his only request: “remember me.” Don’t forget me. Personally, I hold the opinion that he was believing for the first. Let’s not forget that he is being crucified by Romans. They don’t stick people up on crosses for stealing a loaf of bread. No, they crucify political rivals. They kill insurrectionists and rebels in this manner. We don’t know this thief’s backstory like we do for Barabbas (see The Cross and the Sword). What we do know is that, whatever he tried to steal, it was something big, political, and it annoyed the Romans quite a bit. Perhaps he tried to take an eagle. Maybe he tried to kidnap some important Roman for ransom. He might have permanently taken a few tax collectors out of the business. It is possible that it was an ordinary theft but in resisting arrest he ended up killing a soldier or two. Whatever the case, he sinned, pissed off Rome in doing it, and now repented and had faith in Jesus when everybody else’s had faltered. “In paradise.” This is the only time Jesus uses this word. Paradeisos is actually a Greek loan word from Persian where it means the king’s garden. The Septuagint uses it for the Garden of Eden. Paul uses it when he is talking about his vision of heaven (2 Corinthians 12:4). John also uses the word to represent heaven (Revelation 2:7). Some will say Jesus is talking about heaven. Others will say it is Abraham’s bosom where the righteous dead go until Jesus’ resurrection, or until the end times judgment, depending on one’s eschatology. Either way, Jesus is making it clear to this thief that the kingdom, which both are about to enter, is so much more than just this world. React: The audacious faith of that thief is what is required of all of us. We don’t deserve heaven. No matter how good any of us might be, we will never come close meeting its entry requirements. There is nothing we can do to buy, or work our way through those gates. All we can do is have a bit of crazy faith to say, “Jesus, I deserve everything I’ve got coming my way. It’s nothing good and it is everything I’ve earned. But You… You are so much more. When You demonstrate to the world just who You truly are, would You please remember me?” Pray that prayer like You really mean it and just watch what happens. It will blow your mind. Jesus, I believe. You are so much more than I could ever expect or imagine. You have more in store than I could ever dream. One day every knee will bow before You and every tongue will acknowledge that You are Lord. God, to You I bend my knee now. I don’t deserve to come into Your presence. I have done nothing to earn that right. But Your blood, shed on that cross, has paved a way for me. 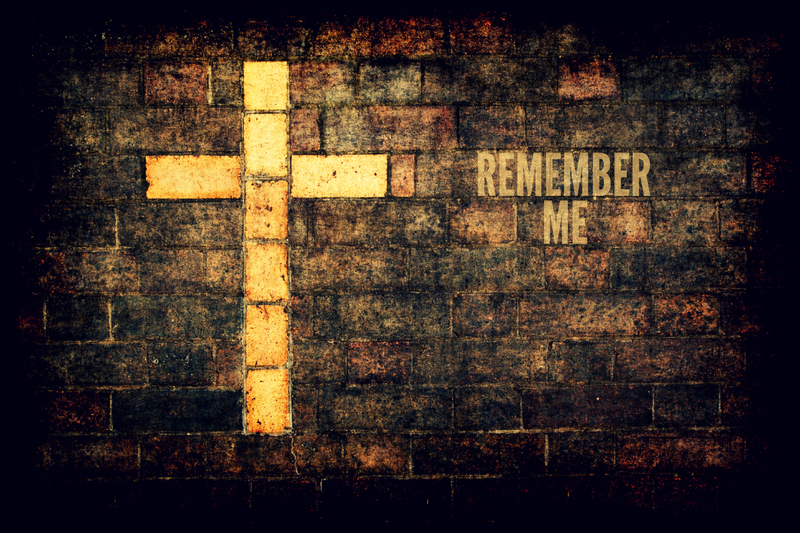 Remember me, Lord. When Your glory is revealed for all to see, remember me. A great Word today. Thank you for sharing and for letting His light shine in you and through you. I felt uncomfortable in my own skin today, but reading this helped me. Thank you brother! :-) It’s amazing to be remembered! Unlike his accomplice, the good theif asked to be taken up rather than be taken down. Jesus, so impressed by his contriteness, forgave him and brought him to heaven on that day. In the end the good theif remained just that, a theif. For he stole heaven. When anyone finds themselves at death’s door, God is called upon by that individual. For the good theif, it just so happened that God was right beside him. He didn’t have to. If I were to say, “Amazing Grace how sweet the sound” it would immediately pull to anyone hearing’s mind the entire song. In the same way, the opening line of the Psalms served for any Jew a representation of that entire Psalm. Just by crying out, “My God, my God, why have You forsaken me?” anyone listening would bring to mind that entire Psalm. This was double entendre at its most poignant.